MMGM: Because of Winn-Dixie -- and then I'm entering the revision ... cave? Keeping it brief today. Just want to add my voice to the chorus of praise for a book I only recently purchased and read, thanks to the urging of my wise blogging friend Barbara Watson. Go to this post for her take on the novel. Synopsis (from the publisher): When ten-year-old India Opal Buloni moves to Naomi, Florida, with her father, she doesn't know what to expect -- least of all that she'll adopt Winn-Dixie, a dog she names after the supermarket where they meet. With such an unusually friendly dog at her side, Opal soon finds herself making more than a few unusual friends. My view: This is EXACTLY the kind of book I wish I could write. It's quiet -- not a lot of action -- but oh how this lovely little story tugs at your heart-strings. 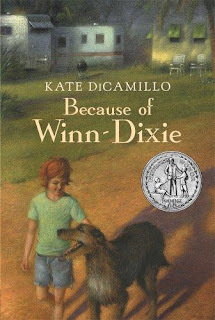 Kate DiCamillo makes it seem deceptively easy. The characters are delightfully quirky. Opal's relationship with her father is complex, realistic and most of all, loving. A simply wonderful book. Now.... I've reached that stage in my writing where I really need to hole up and work like crazy on revisions so I can get on with the querying already! Everyone talks about entering the Revision Cave or the Revision Tunnel. Well, I've always been a little bit afraid of the dark. So I'm heading for Revision Beach. In my head. After all, why pretend to be in a cave, when I can pretend I'm on a beach, with warm sun and palm trees and one of those fresh pineapple drinks with the little umbrella? Oh, and my WIP, of course. Maybe I'll even get some revising done while I'm imagining myself on this beach. But wait! I need a chair. Today, I'm excited to interview A. C. Gaughen, author of SCARLET! Scarlet, by A. C. Gaughen arrives February 14, 2012, from Bloomsbury/Walker, for ages 12 and up. And isn't this one of the coolest covers you've ever seen? Synopsis (from the publisher): Many readers know the tale of Robin Hood, but they will be swept away by this new version full of action, secrets, and romance, from debut author A. C. Gaughen. Posing as one of Robin Hood's thieves to avoid the wrath of the evil Thief Taker Lord Gisbourne, Scarlet has kept her identity secret from all of Nottinghamshire. Only the Hood and his band know the truth: the agile thief posing as a whip of a boy is actually a fearless young woman with a secret past. When the heat turns on the band of thieves as the Sheriff of Nottingham seeks revenge, the romance burns strong between Scarlet and her flirtatious fellow outlaws. Helping the people of Nottingham could cost Scarlet her life as Gisbourne closes in. It's only her fierce loyalty to Robin-whose quick smiles and sharp temper have the rare power to unsettle her-that keeps Scarlet going and makes this fight worth dying for. A.C. Gaughen has been a concierge, a personal shopper, a handbag saleswoman, a wrapper (often and understandably confused with the homonym without a “w”), a call center phone-line answerer, a tour guide for the Commonwealth, a blogger, a writer of research articles like “How to Grind with a Boy”, and, most memorably, someone who couldn’t hang a shirt on a hanger correctly. Through all of these, however, she’s also been a young adult author, and is thrilled to be publishing her debut novel, Scarlet, with Bloomsbury/Walker. Welcome to My Brain on Books! First I'd love to know: do you outline before you write? If so, does it end up changing before you finish the first draft? What change surprised you the most? I like to think I’m a problem solving writer. I get very excited about an idea or a thought and I write whatever I can, and then I hit a snag and I have to work it out. Sometimes that’s outlining from there, sometimes it’s stream-of-consciousness writing until I figure it out, but I can generally make it happen and write again--until I hit another snag! In my experience, outlines rarely work out the way you want them to. Writing is full of surprises! How long did it take to go from the idea for the book to the draft your editor accepted? Was it months or years? Did you go through endless revisions, beta readers, etc, before starting the submission process? Did you ever want to pull out your hair? So, as a writer who unsuccessfully tried to sell a book for YEARS before I wrote Scarlet, even I get frustrated by my answer to this question. I wrote Scarlet in three months; I finished it in December ’09. By the end of January 2010, my agent had offered representation based on Scarlet, and in July of 2010 we were offered the book contract with Bloomsbury/Walker. Now, I will say, my agent and the publishing house negotiated the contract for six agonizing months, so that was really nerve wracking (I emailed my agent weekly asking, “But, they can’t like, say ‘no’ now, can they? This won’t just disappear?”). I did a quick revision with my agent before she submitted it, but honestly Scarlet has always felt to me like a totally magical novel. I have no idea how it came to be! Tell us a little about getting your agent. How many queries did you send out? How long did it take before you got an offer of representation? 3 years, 3 novels, and roughly sixty queries. Several close misses, too--I honestly can’t say enough that kind of like falling in love, the right one comes along at the right time. And it just works! With Scarlet all I could do was write Scar. My head was so full of her voice that I even started talking like that for a while (and once you read the book you’ll know that doesn’t exactly jive for a well-educated girl in the 21st century...). Bizarre. On the book I just finished writing (future unknown), I had to keep “vent” projects going on the side because the subject matter was just really hard for me to write and I had to get my sense of whimsy and fun out in other places. Tea! I’m not a coffee drinker, and frankly I can’t handle the sugar in hot chocolate (though man is it tasty...). I write at work (I man a desk overnight) and at Panera. I LOVE writing in Panera. Free refills, nice fires, comfy seats...what’s not to love? I camp out there and zone out. Thanks for joining us today, A. C. Looking forward to your release date so I can buy the book!